Published in Rafu Shimpo, December 10, 1956. 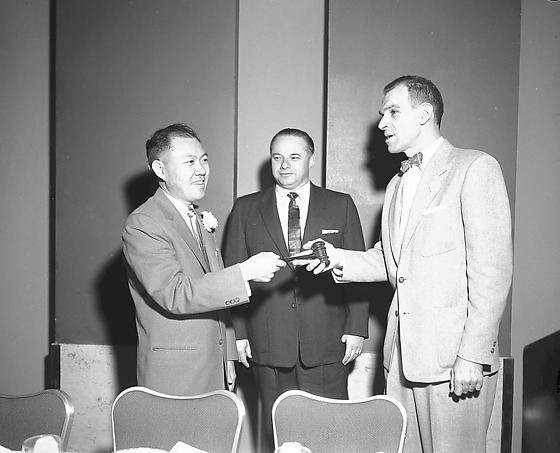 Master Bakers Retailers Association former president, Iz Cohen, presents gavel to president, George Izumi of Grace Pastry Shoppe, at annual installation dinner held at Statler Hotel in Los Angeles, California, December 8, 1956. Tall Caucasian man in bow tie at right hands gavel to a smiling Japanese American man with carnation boutonierre; a Caucasian man, Leo Zweig, executive secretary, stands in center. All men wear suits. Typed on original negative envelope: Bakers Association -- at Statler Hotel -- c/o Mr. Izumi. Izumi was the owner/operator of the Grace Pastry Shoppe. He was the only Nisei in the Master Bakers Retail Association and was the youngest president at 35 years old.